The World Unlimited water speed record is the officially recognised fastest speed achieved by a water-borne vehicle. The current record is 511 km/h (318 mph) - achieved by Australian Ken Warby in the Spirit of Australia in 1978. The record is one of the sporting world's most hazardous competitions. Two official attempts to beat the 1978 record have resulted in the death of the driver; but despite this there are several teams working to make further attempts. The record is ratified by the Union Internationale Motonautique (UIM). William Cogswell's steam yacht Feiseen, which set a new world speed record on 25 August 1893 of 50.8 km/h (31.6 mph). 1903, Charles R. Flint's Arrow: 72.5 km/h (45.06 mph). In 1911 a 12 m (40 ft) stepped planing hull, Dixie IV, designed by Clinton Crane, became the first gasoline powered vessel to break the water speed record. Beginning in 1908 Alexander Graham Bell and engineer Frederick W. "Casey" Baldwin began experimenting with powered watercraft. In 1919, with Baldwin piloting their HD-4 hydrofoil, a new world water speed record of 114.0 km/h (70.86 mph) was set on Bras d'Or Lake at Baddeck, Nova Scotia. In 1920, Garfield Wood set a new water speed record of 120.492 km/h (74.870 mph) on the Detroit River, using a new boat called Miss America. In the following twelve years, Wood built nine more Miss Americas and broke the record five times. Increased public interest generated by the speeds achieved by Wood and others led to an official speed record being ratified in 1928. The first person to try a record attempt was Wood's brother, George. On 4 September 1928, he drove Miss America VII to 149.40 km/h (92.8 mph) on the Detroit River. The next year, Gar Wood took the same boat up a waterway Indian Creek, Miami Beach and reached 149.86 km/h (93.12 mph). Like the land speed record, the water record was destined to become a scrap for national honour between Britain and the USA. American success in setting records spurred Castrol Oil chairman Lord Wakefield to sponsor a project to bring the water record to Britain. Famed land speed racer and racing driver Sir Henry Segrave was hired to pilot a new boat, Miss England. Although the boat wasn't capable of beating Wood's Miss America, the British team did gain experience, which was put into an improved boat. Miss England II was powered by two Rolls-Royce aircraft engines and seemed capable of beating Wood's record. On 13 June 1930 Segrave piloted Miss England II to a new record of 158.94 km/h (98.8 mph) average speed during two runs on Windermere, in Britain's Lake District. Having set the record, Segrave set off on a third run to try to improve the record further. Unfortunately during the run, the boat struck an object in the water and capsized, with both Segrave and his co-driver receiving fatal injuries. Following Segrave's death, Miss England II was salvaged and repaired. Kaye Don was chosen as the new driver for 1931. However, during this time, Gar Wood recaptured the record for the U.S. at 164.41 km/h (102.16 mph). A month later on Lake Garda, Don got the record back with 177.387 km/h (110.2 mph). In February, 1932 Wood responded, nudging the mark to 179.779 km/h (111.709 mph). Determined to have the last word over his great rival, Gar Wood built another new Miss America. Miss America X was 12 metres long, powered by four supercharged Packard aeroplane engines. On 20 September 1932 Wood broke the 200 km/h barrier, driving his new boat to 200.943 km/h (124.860 mph). It would prove the end of an era. Don declined to attempt any further records, and Miss England III went to the National Maritime Museum in London, where it remains on display. Wood also opted to scale down his involvement in racing and returned to running his businesses. Somewhat ironically, both record-breakers lived into their 90s. Wood died in 1971, Don in 1985. Wood's last record would be one of the final records for a conventional, single-keel boat. In June 1937 Malcolm Campbell, the world-famous land speed record breaker, drove Blue Bird K3 to a new record of 203.31 km/h (126.33 mph) at Lake Maggiore. Compared to the massive Miss America X, K3 was a much more compact craft. It was 5 metres shorter and had one engine to X's four. Despite his success, Campbell was unsatisfied by the relatively small increase in speed. He commissioned a new Blue Bird to be built. Blue Bird K4 was a ‘three pointer’ hydroplane. Unlike conventional powerboats, which have a single keel, with an indent, or ‘step’, cut from the bottom to reduce drag, a hydroplane has a concave base with two sponsons fitted to the front, and a third point at the rear of the hull. When the boat increases in speed, most of the hull lifts out of the water and runs on the three contact points. The positive effect is a reduction in drag; the downside is that the three-pointer is much less stable than the single keel boat. If the hydroplane's angle of attack is upset at speed, the craft can somersault into the air, or nose-dive into the water. Campbell's new boat was a success. In 1939, on the eve of the Second World War, he took it to Coniston Water and increased his record by 18 km/h (11 mph), to 228.11 km/h (141.74 mph). The return of peace in 1945 brought with it a new form of power for the record breaker – the jet engine. Campbell immediately renovated Blue Bird K4 with a De Havilland Goblin jet engine. The result was a curious-looking craft, whose shoe-like profile led to it being nicknamed ‘The Coniston Slipper’. The experiment with jet-power was not a success and Campbell retired from record-attempts. He died in 1948. On 26 June 1950, Slo-Mo-Shun IV improved on Campbell's record by 29 km/h (18 mph). Powered by an Allison V-1710 aircraft engine, the boat was built by Seattle Chrysler dealer Stanley Sayres and was able to run 260 km/h (160 mph) because her hull was designed to lift the top of the propeller out of water when running at high speed. This phenomenon, called ‘prop riding’, further reduced drag. In 1952, Sayres drove Slo-Mo-Shun to 287.25 km/h (178.49 mph), a 29 km/h (18 mph) increase on his previous record. The renewed American success persuaded Malcolm Campbell's son, Donald, who had already driven Blue Bird K4 to within sight of his father's record, to make a further push for the record. However, Blue Bird K4 was by now 12 years old, with a 20-year-old engine, and Campbell struggled to reach the speeds of the Seattle-built boat. In late 1951, she was written-off when it suffered a structural failure at 270 km/h (170 mph) on Coniston Water. At this time, yet another land speed driver entered the fray. Englishman John Cobb, was hoping to reach 320 km/h (200 mph) in his jet-powered Crusader. A radical design, the Crusader reversed the ‘three-pointer’ design, placing the sponsons at the rear of the hull. On 29 September 1952 Cobb tried to beat the world record on Loch Ness but, while travelling at an estimated 338 km/h (210 mph), Crusader's front plane collapsed and the craft instantly disintegrated. Cobb was retrieved from the water but had already died of shock. Two years later, on 8 October 1954, another man would die trying for the record. Italian textile magnates Mario Verga and Francesco Vitetta, responding to a prize offer of 5 million lire from the Italian Motorboat Federation to any Italian who broke the world record, built a sleek piston-engined hydroplane to claim the record. Named Laura III, after Verga's daughter, the boat was fast but unstable. Travelling across Lake Iseo, in Northern Italy, at close to 306 km/h (190 mph), Verga lost control of Laura III, and was thrown out into the water when the boat somersaulted. Like Cobb, he died of shock. Following Cobb's death, Donald Campbell started working on a new Bluebird, K7, a jet-powered hydroplane. Learning the many lessons from Cobb's ill-starred Crusader, K7 was designed as a classic 3 pointer with sponsons forward alongside the cockpit. She was designed by Ken and Lewis Norris in 1953-54 and was completed in early 1955. She was powered by a Metropolitan-Vickers Beryl turbojet of 16 kN (3,500 lbf) thrust. K7 was of all-metal construction and proved to have extremely high rigidity. Campbell and K7 set a new record of 325.60 km/h (202.32 mph) on Ullswater in July 1955. Campbell and K7 went on to break the record a further six times over the next nine years in the US and England (Coniston Water), finally increasing it to 444.71 km/h (276.33 mph) at Lake Dumbleyung in Western Australia in 1964. Campbell thus became the most prolific water speed record breaker of all time. At the time Campbell set the absolute record, the piston-powered propeller-driven record was held by the George Simons' Miss U.S. I  at 322.54 km/h (200.42 mph). This record was set at Guntersville, Alabama in 1962 by Roy Duby and stood for 38 years. Donald Campbell's Bluebird K7 had been re-engined with a Bristol Siddeley Orpheus jet rated at 4,500 lbf (20 kN) of thrust. On 4 January 1967 he tried again. His first run averaged 475.2 km/h (295.3 mph) and a new record seemed in sight. Campbell applied K7's water brake to slow the craft down from her peak speed of 507 km/h (315 mph) clear of the measured kilometre to a speed around 350 km/h (220 mph). Rather than waiting for the lake to settle again before starting the mandatory return leg, Campbell immediately turned around at the end of the lake and began his return run. At around 512 km/h (318 mph), just as she entered the measured kilometre, Bluebird began to lose stability and 400 m before the end of the kilometre, Bluebird's nose lifted beyond its critical pitch angle and she started to rise out of the water at a 45 degree angle. The boat took off, somersaulted and then plunged nose-first into the lake, breaking up as she cartwheeled across the surface. Campbell was killed instantly. Prolonged searches over the next two weeks located the wreck, but it was not until May 2001 that Campbell's body was finally located and recovered. Campbell was buried in the churchyard at Coniston on 12 September 2001. Lee Taylor, a Californian boat racer, in Hustler during a test run on Lake Havasu, was unable to shut down the jet and crashed into the lakeside at over 200 km/h (100 mph). Hustler was wrecked and Taylor was severely injured. He spent the following years recuperating, and rebuilding his boat. On 30 June 1967, on Lake Guntersville, Taylor and Hustler tried for the record, but the wake of some spectators' boats disturbed the water, forcing Taylor to slow down his second run, and he came up 3.2 km/h (2 mph) short. He tried again later the same day and succeeded in setting a new record of 459 km/h (285 mph). Until 20 November 1977 every official water speed record had been set by an American, Canadian, Irishman, or Briton. 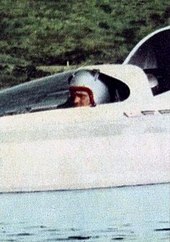 That day Ken Warby became the first Australian holder when he piloted his Spirit of Australia to 464.46 km/h (288.60 mph) to beat Lee Taylor's record. Warby, who had built the craft in his back yard, used the publicity to find sponsorship to pay for improvements to the Spirit. On 8 October 1978 Warby travelled to Blowering Dam, Australia, and broke both the 480 km/h (300 mph) and 500 km/h barriers with an average speed of 511.12 km/h (317.6 mph). As he exited the course his peak speed as measured on a radar gun was approximately 552 km/h (345 mph). Warby's record still stands as of 19 September 2018[update]. There have only been two official attempts to break it, both resulting in the death of the driver. Originally Taylor tested the boat on Walker Lake in Nevada but his backers demanded a more accessible location, so Taylor switched to Lake Tahoe. An attempt was set for 13 November 1980, but when conditions on the lake proved unfavourable, Taylor decided against trying for the record. Not wanting to disappoint the assembled spectators and media, he decided to do a test run instead. At 432 km/h (270 mph) Discovery II started to become unstable. It has been speculated that it may have hit a swell. Whatever the cause, the boat's unstable lateral oscillations caused the left sponson to collapse, sending the boat plunging into the water. The cockpit section with Taylor's body was recovered three days later. The cockpit had not floated as intended and Taylor drowned as a result. In 1989 Craig Arfons, son of Walt Arfons, builder of the world's first jet car, and nephew of famed record breaker Art Arfons, tried for the record in his all-composite fiberglass/Kevlar Rain X Challenger, but died when the hydroplane somersaulted at 483 km/h (301.875 mph). The British Quicksliver project is managed by Nigel Macknight. The design was initially based on concepts for a rear-sponsoned configuration by Ken Norris, who had worked with the Campbells on their 'Bluebird' designs. The design is of modular construction with the main body consisting of a front section with a steel spaceframe incorporating the engine, a Rolls-Royce Spey Mk.101, and the rear section a monocoque extending to the tail. The front sponsons are also modules, one of which contains the driver. Ken Warby is working with his son David on a new boat, powered by a jet engine taken from a Fiat G.91, to break the record. Earlier in 2003, Ken Warby had built another boat, Aussie Spirit for a record attempt. The K777 Team is a combination of engineers, boat racers, boat builders, gas turbine specialists and Members of Windermere Boat Racing Club. They built a controversial visual copy of Donald Campbell's Bluebird K7, though during its sole public appearance on Coniston Water in 2011 it failed to plane, partially sank, and ultimately collapsed its air intake trunking. A test on Loch Ken, in south-west Scotland, in October 2014 was also unsuccessful; although the boat did not sink, it was again unable to plane. Daniel Dehaemers is the Belgian challenger for the absolute water speed record. The SP600 is of full carbon composite construction and is powered by a Rolls-Royce Adour 104 turbojet engine. The boat was planned to be tested during 2016. However, after finishing building the boat he died of cancer in 2018 before he managed to trial the craft. A British Team, with a serving British Military pilot at the helm, are working together to build and run Longbow, a jet hydroplane, on lakes and lochs within the UK, for a British attempt upon the Outright World Water Speed Record. ^ a b c d Field, Leslie (15 August 2008). "The World Water Speed Record". Hydroplane History. Retrieved 13 November 2008. ^ "Yachts Built by Wood" (PDF). International Yacht Restoration School. 2006. Retrieved 1 September 2008. ^ Martin, Robert E. (June 1929). The Speediest Craft Afloat. Popular Science Monthly. pp. 20–21, 146. Retrieved 25 June 2012 – via Books.google.com. ^ Lohnes, Brian. "8 Ton Sledge: Gar Wood's 7,000hp Miss America X Boat Owned The World In '32 and '33". BangShift.com. Retrieved 3 August 2017. ^ "Algonac, S.U.A. Gar Wood batte il record mondiale per motoscafi con 125,42 miglia all'ora". Retrieved 3 August 2017. ^ "Water speed record (fastest boat)". guinnessworldrecords.com. Guinness World Records. Retrieved 7 August 2015. ^ Huxley, John (13 February 2015). "Water speed record to be put to the test 40 years on as Spirit of Australia II takes shape". The Sydney Morning Herald. Fairfax Media. Retrieved 7 August 2015. ^ "The Craft". Quicksliver-WSR. Retrieved 3 August 2017. ^ a b Huxley, John (14 February 2015). "The Warby need for speed". Sydney Morning Herald. Retrieved 3 August 2017. ^ "SPIRIT OF AUSTRALIA II". Warby Motorsport. Retrieved 3 August 2017. ^ Johnson, Jason (19 June 2018). "David Warby To Challenge Father's World Water Speed Record". Retrieved 3 July 2018. ^ "K777 Team". K777club.com. Retrieved 25 June 2012. ^ "1967 Bluebird replica takes to the water at Loch Ken". ITN. ITN. Retrieved 15 March 2015. Bill Tuckey (2009). The World's Fastest Coffin on Water. A biography of Ken Warby. Wikimedia Commons has media related to Water speed record motorboats. Speed Record Club - The Speed Record Club seeks to promote an informed and educated enthusiast identity, reporting accurately and impartially to the best of its ability on record-breaking engineering, events, attempts and history.